This movie was already promoted since few weeks ago in the theaters through its trailer. As the sequel to a very good movie, obviously it was intriguing to see if it can continue or be even better than the original one. The film had premiered since 2 days ago but my wife and I already set our mind to see Despicable Me 3 then, so we planned to see this in next available time. Luckily my wife and I won tickets for the movie from a quiz held by news portal Merahputih.com and Overdoze Coffee shop (one of the sponsor of the movie). With my wife's 2 nephews and her younger sister who also won a ticket from another quiz, we saw this one at Plaza Senayan last night at 6.15 PM. Now let us get on with the movie. Movie started 2 years after the original movie left off, where Ben (Chicco Jerikho - Bukaan 8, Surat Cinta Untuk Kartini etc) and Jody (Rio Dewanto - Surat dari Praha, Modus Anomali etc) went around Indonesia in their kombi van to introduce and "give away" their best coffee. After doing the same stuff over and over again, they realized that they were going nowhere. So they decided to return to Jakarta and re-opening their Filosofi Kopi coffee shop. However, things were not as easy as they seemed. They needed to look for investors to pump in capital due to the very large investment required to open the shop, not to mention the various competitions they face with the opening of many coffee shops every now and then. Until they finally found Tarra (Luna Maya - Cinta Silver, Jakarta Undercover etc) who was keen to invest. After various considerations, finally Tarra became the part owner of Filosofi Kopi and they started the process to re-open the shop. With the help from their ex team and also a newly recruited barista called Brie (Nadine Alexandra - former 2010 Putri Indonesia & Indonesian representative to 2011 Miss Universe) they got ready to open up the shop. But Ben's ego and idealism really made him having difficulty to accept Brie who was doing everything by the book and in a precise manner that made the coffee making process very slow. Things got even more complicated when Ben and Tarra seemed to be interested in each other, with Jody seemingly interested in Tarra as well. 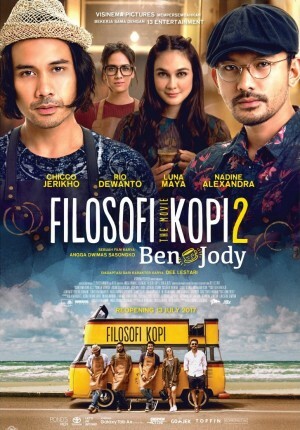 A lot more would happen among Ben, Jody and Tarra as they tried their best to revive Filosofi Kopi once again. I would not want to expose too much of the plot line, so you just have to see it to enjoy the journey towards their goal. To understand this movie, you really need to see the original movie first so you would be able to see the struggle Ben and Jody had in making Filosofi Kopi as legendary as it was told in this sequel and also the connection to some events in the first movie. Because of its status as a sequel, I could not help but to compare this movie with the original one. In here the movie was focusing more on how challenging it was to open a new coffee shop and the sub-plot of love triangle among Ben, Jody and Tarra which could jeopardize the friendship of Ben and Jody, plus of course the surprising twist in the middle of the movie. Meanwhile the original movie was focusing on Ben's struggle of creating the best coffee and also to fight his own demon from the past, while Jody had to struggle to keep the coffee shop alive. If you have watched that one you would notice that the first movie was focusing on idealism of a genuine coffee lover and it had a fast pace with many dramatic moments. In this one, I had a feel that it was having much slower pace and in fact sometimes a bit draggy which made the movie felt losing its momentum. Plus this one also got too much product placements which were too obvious at times. So if I had to compare, I prefer the original movie than this sequel. As a standalone movie, it was actually quite good. It had some interesting moments with major conflict between Ben and Jody due to women and I really think that Chicco Jerikho and Rio Dewanto were absolutely amazing in this movie (and its original). They were able to go into characters and made me feel they really were the idealist Ben and the realist Jody in real life. I love the other supporting roles as well such as Jody's older sister (Melissa Karim), Ben's father (Otig Pakis) and also Joko Anwar despite having only brief moment. Unfortunately I felt that Luna Maya's performance in here was not at her best, while Nadine Alexandra seemed to be given a bit too little screen time to show audience what she could do. Another big plus of this movie I believe was the wonderful soundtracks. The songs in here were nice and lovely which was understandable with Glenn Fredly as music producer. Some scenes were also given the perfect song for the situation then. In addition, the movie also showed wonderful Indonesian sceneries like in Yogyakarta and Toraja plus the great sceneries of a coffee farm. There were quite a number of funny moments whenever Ben and Jody were "fighting" just like any old friends who have known each other for very long time. The director Angga Dwimas Sasongko was able to compile a friendship story, love triangle and at the same time coffee philosophy into a nice movie, even if it was not as great as his work in the original. One thing to take note is that the movie was targeting mature audience as there were brief strong(obscene) languages plus the subject also was about coffee which might not interest younger audience. In the end, if you are coffee lover and you want to see various coffee shops and also would like to know more about the business, this movie would be good for you to see. Now if you are a neutral like me, then you could certainly be entertained by the 2 good lead actors. And if you are a softie, there were plenty of emotional moments in the movie that would satisfy you (as I know my wife was very touched in 1 particular scene near the end). Finally, it was an enjoyable night for me and my wife especially as we were also accompanied by family. Have fun watching this movie! PS: For every ticket purchased for this movie, a small donation would be given to the coffee farmer in Indonesia which is a nice gesture from the producer.